MedicalResearch.com: What is the background for this study? Would you briefly explain what is meant by prurigo nodularis? Response: Prurigo nodularis is a skin condition where patients develop extremely itchy nodules throughout the body. Little is known about why this happens or which groups of people are predisposed to develop this condition. Response We found that prurigo nodularis disproportionately affects African-Americans as compared to the general population. 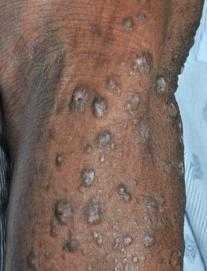 Diabetes, Hepatitis C, chronic kidney disease, and HIV are also more common in patients with prurigo nodularis than the general population or patients with other inflammatory skin diseases studied, such as atopic dermatitis and psoriasis. We also found that people with prurigo nodularis are more likely to be depressed than patients with other inflammatory skin diseases, such as atopic dermatitis or psoriasis. Response: Prurigo nodularis is an inflammatory skin disease that dramatically reduces quality of life and is associated with several medical comorbidities. Our study highlights significant racial differences in prurigo nodularis. Response: Future studies are ongoing to identify the molecular causes of prurigo nodularis, including genes responsible for racial differences and biomarkers of disease severity. Response: Little is known by dermatologists and other medical specialists about prurigo nodularis. My hope is that our work increases awareness and promotes a greater understanding of prurigo nodularis so we can best serve our patients. Prurigo nodularis has no current FDA approved therapies and treatment can be very difficult. With greater awareness, prurigo nodularis will hopefully become a priority for further research by funding agencies so additional translational studies can commence to help these patients. Disclosures: I am an advisory board member for Menlo and Trevi Therapeutics. Boozalis E1, Tang O2, Patel S1, Semenov YR3, Pereira MP4, Stander S4, Kang S1, Kwatra SG5. This entry was posted in Author Interviews, Dermatology, Johns Hopkins and tagged dermatology, itch, prurigo, racial disparities by Marie Benz MD FAAD. Bookmark the permalink.